As far as I know, open-faced turkey sandwiches are an after Thanksgiving leftover thing. Right? And it’s kind of way after Thanksgiving at this point, so I wondered whether it was appropriate to post this recipe now. But this site is vegan, and that changes things. 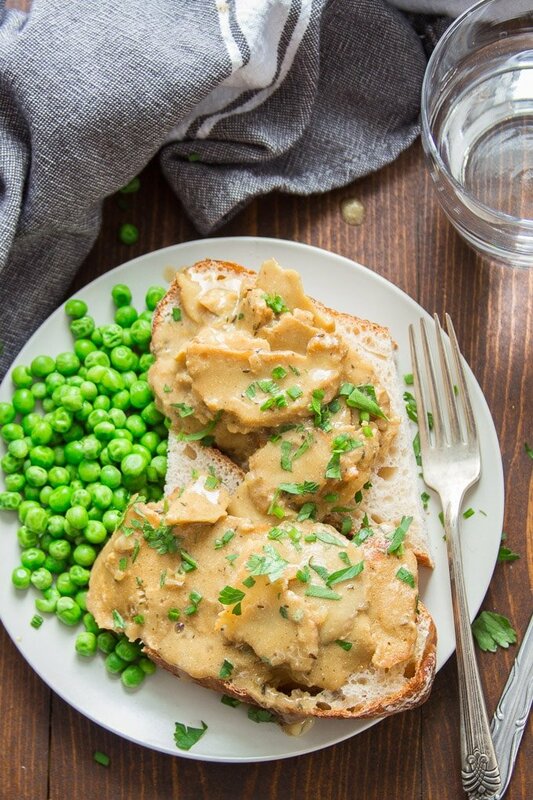 This is actually an-open faced seitan sandwich, and while maybe some of you have leftover seitan after Thanksgiving, probably just as many of you end up with leftover portobello mushrooms or lasagna or meatless loaves. We’re kind of all over the place when it comes to holiday main dishes! With that in mind, I decided this was an anytime sandwich. Or, rather, a sandwich for those times when you just need some good old comfort food. Like late winter, which, hey, is just about now! I recommend making your own seitan for this sandwich, if you can. If use my recipe, go for the chicken-style seitan. I know, chicken isn’t turkey, but the flavors are pretty similar, and when you smother it in gravy, it’ll taste like turkey. Why is making your own seitan important? Because you can cook up the seitan in relatively large chunks and slice it super thin for sandwiches. I never see seitan sold in big hunks at the store. If you must use store-bought seitan, buy the largest pieces that you can find and slice them as thin as you can. I sliced my seitan using a mandoline slicer, which worked great. If you don’t have one of those and aren’t willing to invest in one, use a super sharp chef’s knife to slice the seitan as thin as you can. Once you’re prepped your seitan, you’ll be browning the slices in a bit of vegan butter in a skillet. Cook them in batches if you need to, to ensure each slice gets a little bit browned. Next, remove the slices from the skillet and make your gravy. I adapted the gravy recipe for this from my super simple vegan gravy. I wanted the gravy for these sandwiches to be a bit creamier, so I included some non-dairy milk, as well as some nutritional yeast for extra savory flavor. Sauté an onion in some oil for a few minutes. Next, add some garlic and flour (for thickening) and cook everything for another minute or so. Whisk in some broth and seasonings and let everything simmer for a few minutes, until you have a thick, rich gravy. Return the seitan slices to the skillet and let them simmer in the gravy for a minute. This will soften them up and give them a chance to soak up some flavor from the gravy. 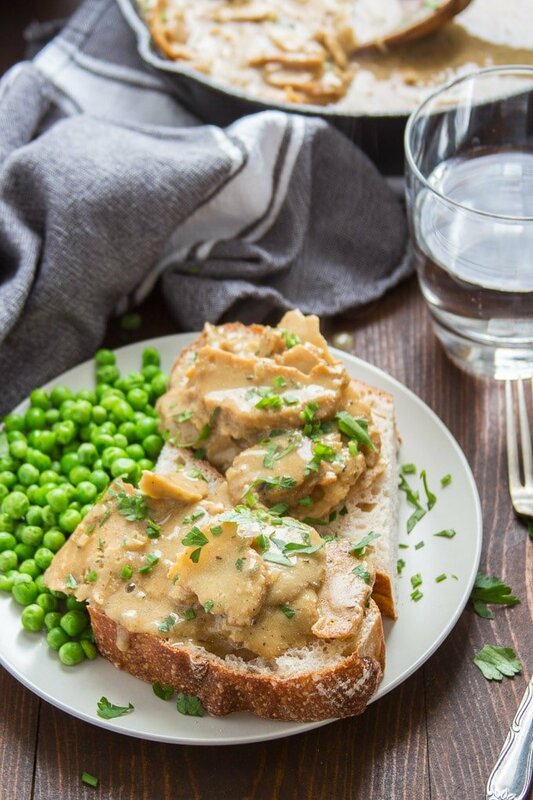 Spoon your seitan slices and gravy over some toasted crusty bread, sprinkle with parsley if you like and devour! If you have leftovers, just store the vegan turkey slices and gravy together in a sealed up container in the fridge. It will keep for 3-4 days. Reheat the turkey and gravy together in the microwave or a saucepan. If the gravy gets too thick during storage, just add a splash of water. What kind of bread works best with this recipe? Anything thick and crusty! I used sourdough. Can this recipe be made gluten-free? Unfortunately, seitan is made from mostly wheat gluten, so that would be tough to work around. I highly recommend making your own seitan for this, using the recipe linked here. If you use store-bought, buy the largest pieces possible so you can slice it easily. Shredding your store-bought seitan using the shred blade of a food processor might be a good alternative if you can’t get your slices just right. If using homemade seitan, slice it as thin as possible, preferably using a mandoline slicer. If using store-bought, slice it thin as best as you can using a mandoline or sharp knife (depending on the size and shape of your seitan pieces). Place 1 tablespoon of vegan butter in a medium skillet and melt it over medium heat. Give the butter a minute to heat up, and then add the seitan slices. Avoid overcrowding the skillet, and cook the slices in batches if needed. 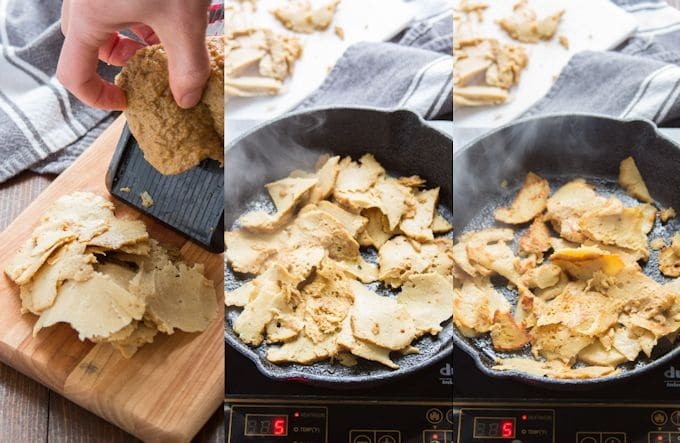 Cook the seitan slices for about 5 minutes on each side, until lightly browned, and then remove them from the skillet and transfer them to a plate. 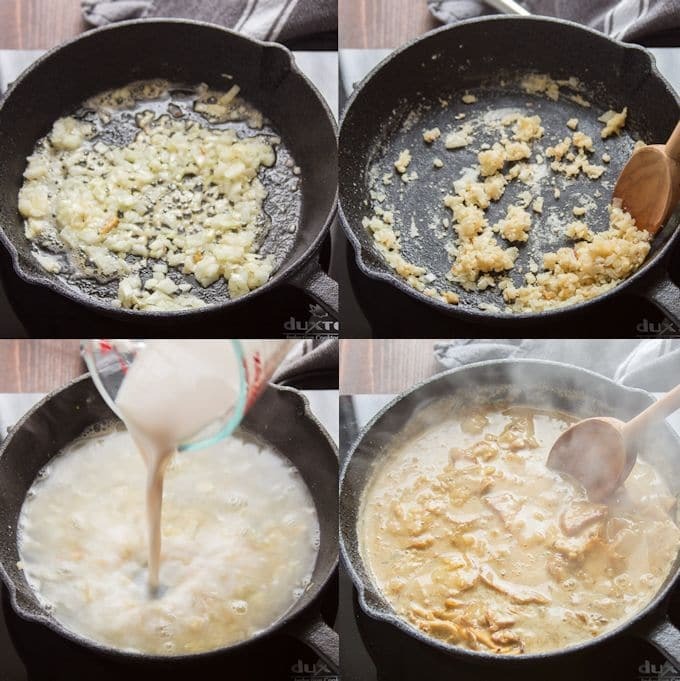 Melt the remaining 2 tablespoons of butter in the skillet. Add the onion and cook for about 5 minutes, until soft and translucent. Add the garlic and flour, and stir well to coat the onions with flour. Cook for about 1 minute more, until the garlic becomes very fragrant. Whisk in the water, milk, nutritional yeast flakes, soy sauce, vinegar, thyme, and rubbed sage. Raise the heat and bring the mixture to a simmer. Lower the heat and allow it to simmer, uncovered, for about 10 minutes, until it thickens up a bit. Return the seitan slices to the skillet and stir them into the gravy. Cook for about 1 minute more, just to heat up the seitan and give it a chance to absorb some gravy. Remove the skillet from heat and season the gravy with salt and pepper to taste. Arrange the bread slices on plates in pairs, and top with the turkey and gravy. Sprinkle with parsley and/or chives, and serve. You rock. This recipe is totally happening tonight. I’ll post rave reviews afterwards. :) Your recipes always work and are always terrific! Thanks Suzanne! That sounds delicious! Enoy!! Yes! It was delicious! Everyone loved it. Love your recipes and love your site. I’m so glad you think so! Thanks so much Morgan!! 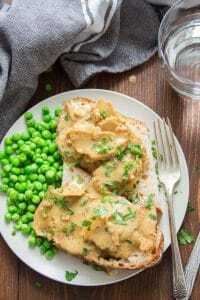 This looks amazing and I can see how your seitan recipie works so well for it. I’m new to all things vegan so experimenting a lot at present. I made a batch of seitan yesterday using your recipie SO EASY!!!! Plus the broth is an amazing gravy so I won’t need to make any vegan gravy as already have it. I made my own veggie broth base with carrot onion celery and 1 vegan veg stock cube and whizzed it all together once the veggies were soft so a nice base to start with. Will definately try this sandwich and use my homemade cranberry sauce too. I wished I had some cranberry sauce on hand when I made these – that would be an awesome meal! I’m glad you like the seitan and I hope you enjoy these sandwiches! 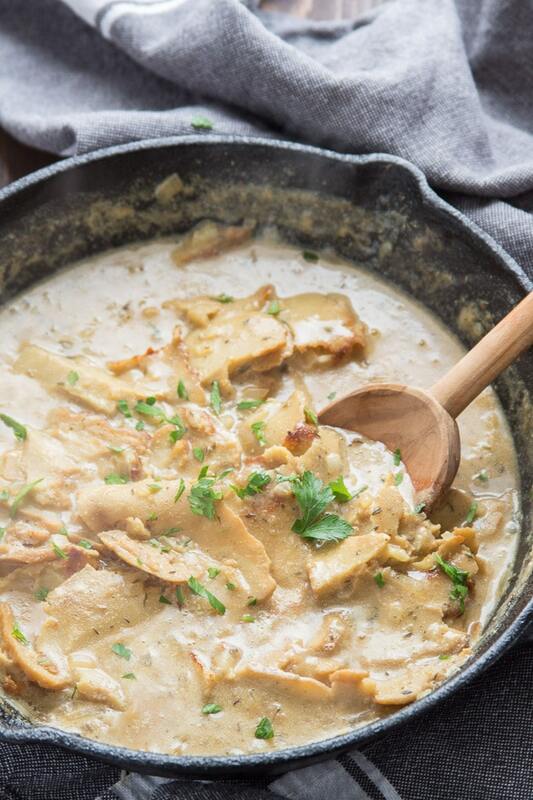 Thank you for this recipe — I added some sautéd mushrooms to the gravy mix. It is delicious! That sounds delicious! Glad you enjoyed it! !